Hold on to something for balance. Standing on one leg, grasp the foot of the other leg. Keep your knee pointing down. Pull up with light pressure. You do NOT need to pull up all the way to your buttocks. If it feels uncomfortable or painful, you are putting too much strain on the knee joint. Hold your foot behind you for 10-20 seconds, then switch sides. 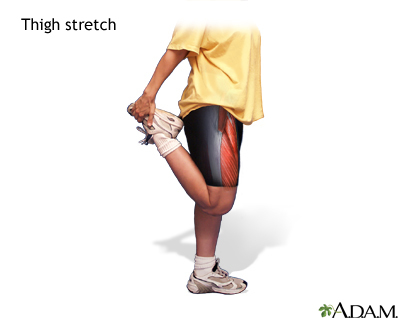 You should feel the stretch in the front of the thigh.